Every so often I like to do a quick roundup of things that I’m enjoying in life just now – mainly things I’ve encountered by chance, occasionally things I’ve been sent for review. I meant to do one before Christmas but ran out of time, so I thought I’d do one now instead. Radio Paradise: Radio Paradise is a digital radio station, and it’s the only thing we ever listen to in this house. We’ve completely abandoned our own music collections since we found it. Based in Paradise, California, and run by husband and wife Bill and Rebecca Goldsmith, it is commercial-free, listener-supported, and they play nothing but brilliant music. There is no chat at all, just an eclectic mix of old and new music in almost every style. It’s a bit like Spotify, but with more chance of you finding previously unknown music that you love. Gillian Kyle: I gave so many Gillian Kyle gifts to people over Christmas. I absolutely love her quirky wee bags, mugs, t-shirts, babygros, coasters and cards, which use iconic food designs like Tunnocks teacakes, Creamola foam, and Mother’s Pride, along with some lovely old seaside café menus. This is retro loveliness at its very, very best, and if you know any Scottish expats then I promise that a gift from here would bring them great joy. Wombi Apps: DorkySon has had Wombi Clock to play on my phone for a few months, and he gets a lot out of it, but there are now two more Wombi apps that he loves even more. 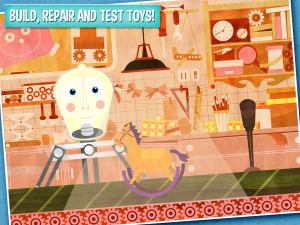 Wombi Toys is a workshop where you have to repair and build broken toys (stringing a guitar, pumping up a football, putting the limbs on a doll etc). It’s nice and simple to use, but he seems happy to play it again and again, and when I was visiting a friend a few weeks ago, her children took my phone hostage so they could play it too! Wombi Ice Cream is slightly trickier – the player is a server at an ice cream stand, and as customers come up you have to prepare the ice cream that they ask for. It took DorkySon a few goes to get the hang of this one – especially as the orders get more complicated the longer you play – but now that he understands the concept it’s another firm favourite. Condimentalist: Sabrina is a graphic designer and an old university friend of mine (you can say hello on Twitter here). She designed the brilliant flyer for DorkyDad’s Fringe Show a couple of years ago. As a keen chef, she thought it might be fun to start drawing some of the herbs, spices and sauces in her kitchen cupboard, and that has now developed into a blog called Condimentalist. 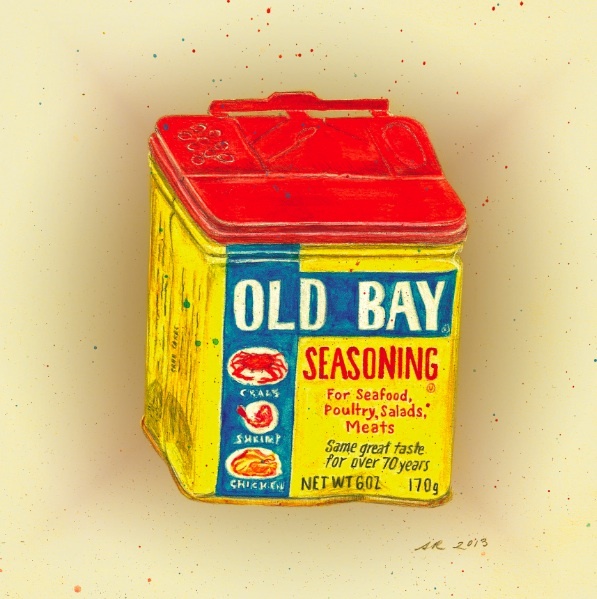 The image above is one I commissioned for DorkyDad’s Christmas present, because Old Bay Seasoning is his go-to item in our own kitchen. If you have a Marmite, HP Sauce or Tabasco fan in your house, these pictures make a lovely personal gift. Disclosure: We were send codes to download Wombi Toys and Wombi Ice Cream for free. I have received no other payment for this post, and all opinions are my own. Paradise sounds like, well, Paradise… I’ll be giving it a go for sure! Going to see if I can find Paradise! Always great to get app recommendations that don’t involve princesses or dressing up Angelina Ballerina! And I’m going to do a search for Paradise now …. Thanks for tips! Loved perusing the Condimentalist’s site today – great fun! And have never heard of Radio Paradise – will be checking it out soon. All this cool stuff belies your dorkiness! Ha! Dorky is just how T used to pronounce our surname! He referred to us at the Dorky Family and it stuck. Fairly appropriate though!